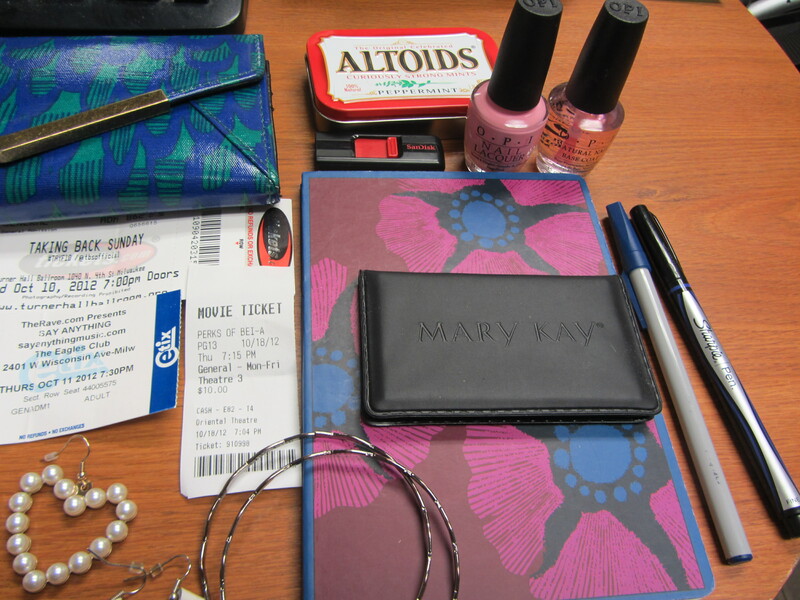 Good question… This post is inspired by Audrey Kitching who does a “What’s in my Bag” post every so often. Thought I would adopt it for my blog as well. 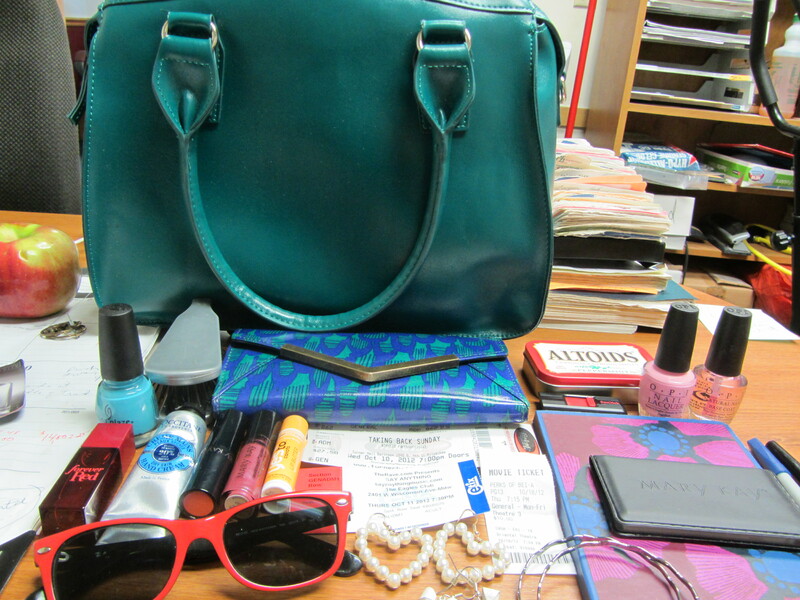 What’s in my bag, you ask? Turns out a lot of junk…. not exactly how Audrey’s posts go, but I’ll improvise. 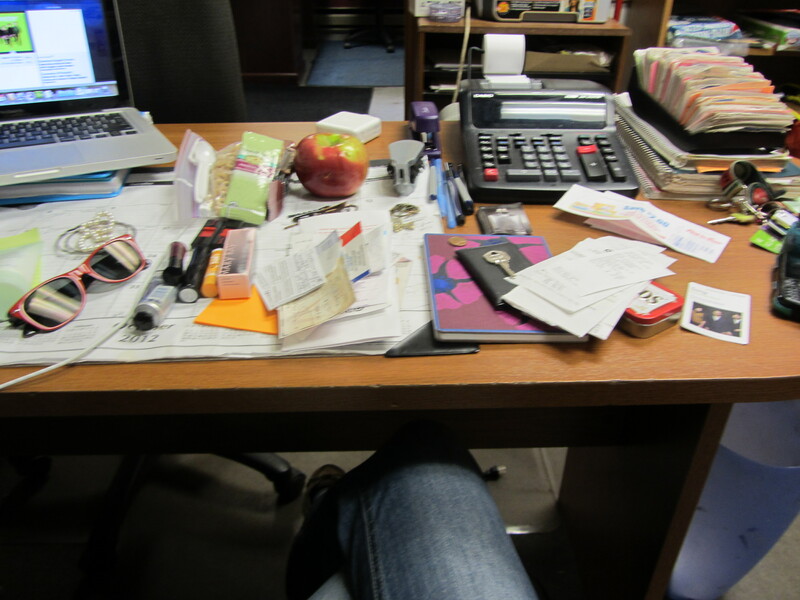 So after weeding out all the random junk and receipts, setting my lunch aside, and laying everything out on my desk this is what I’ve got. I still had my notebook in there from my Mary Kay meeting along with my business cards and some pens. The jewelry was thrown in from when I took it off and didn’t know what else to do with it or when I didn’t have time to put it on before leaving the house, still with the intention of grabbing it out of there and wearing it or putting it where it belongs. The nail polish is “Pink Friday” from the OPI Breast Cancer collection and is my shade of the moment. I never thought about breast cancer until it affected my family. My grandma was diagnosed in February last year and it’s so difficult to even think about some days. The concert tickets are from Bayside/Taking Back Sunday on October 10th and Say Anything on October 11… two awesome days of concerts with Brian. Bayside is his favorite band and Say Anything is probably my second favorite aside from Jimmy Eat World, so we both had a really great time. I managed to shimmy up to the second row at the Say Anything concert and it was just pure amazingness. The other ticket is from seeing “Perks of Being a Wallflower” last night with Jamie at the Oriental Theatre. We both co-ran a Literati book club in high school and “Perks” was one of our selections. I read it a couple times in high school and I re-read it recently because the movie was coming out soon, and every time I read it, I feel so different. I connect with Charlie. When Jamie and I emerged from the dark theatre, we were silent for a while because we felt different. It was just such an intense movie and we had to fully absorb it. Even though we knew what happened from reading the book, we enjoyed it thoroughly. I was nervous that the movie wouldn’t live up to my expectations, but I’m relieved and glad that it exceeded expectations. The author of the book was in the production team, so I’m sure that helped. 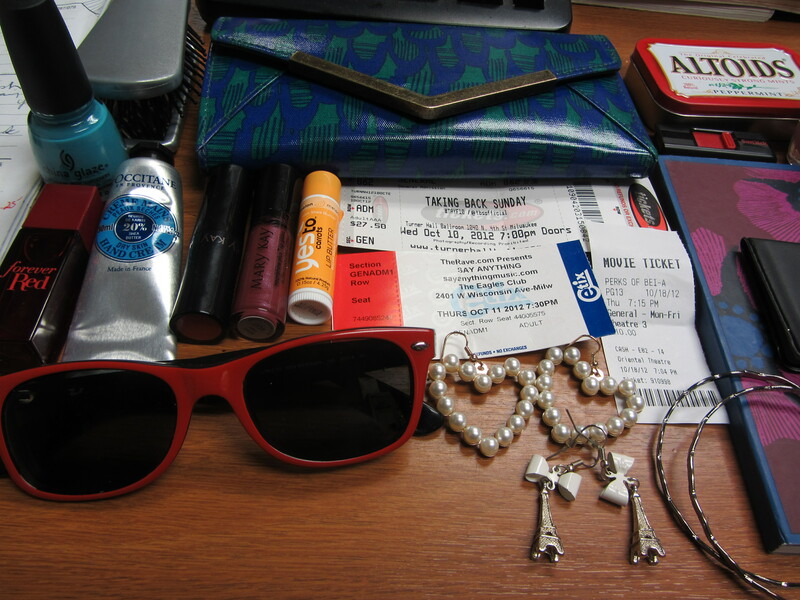 I always keep a hair brush, my Ray Bans, a tube of lotion, altoids, and some sort of lip product in my bag. For chapstick, I really like the “Yes to Carrots” brand. There’s flavors like pomegranate, mint, berries, carrot, and this one here is the melon flavor. 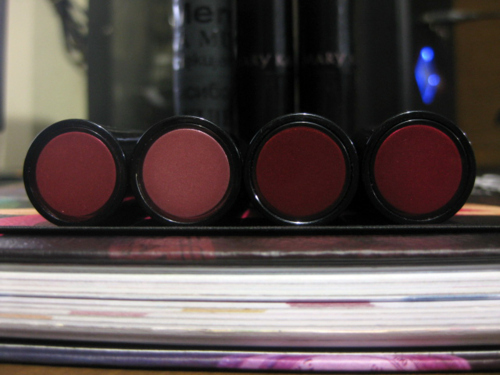 I also have the Mary Kay lipstick in Appleberry and the lipgloss in Berry Tart. They both look great together or alone. What do the contents say about me? That I’m adventurous because of all the concert tickets? That I’m a writer because of the notebook? Does it say that I’m a beauty consultant? That I’m vain or a narcissist? These are the pieces from my October so far. Pieces from my current life. 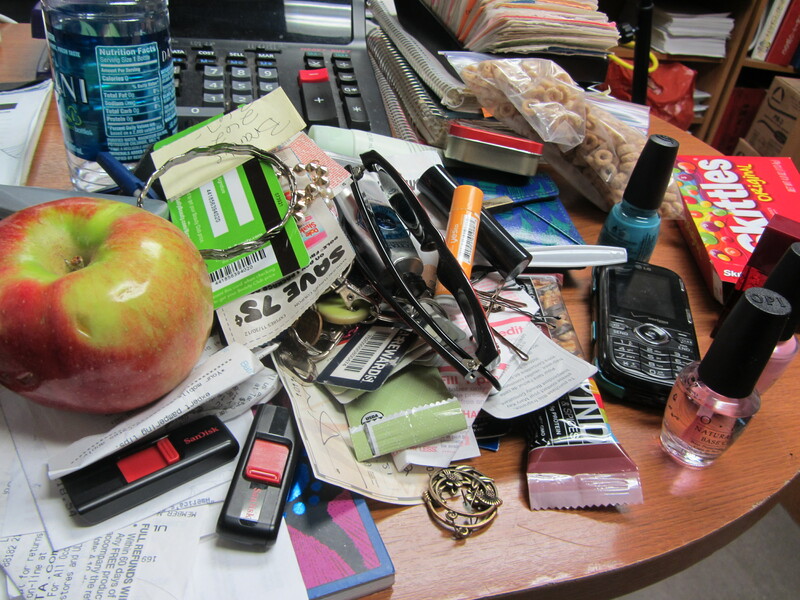 The contents of your bag carry your life. What story does your bag tell? 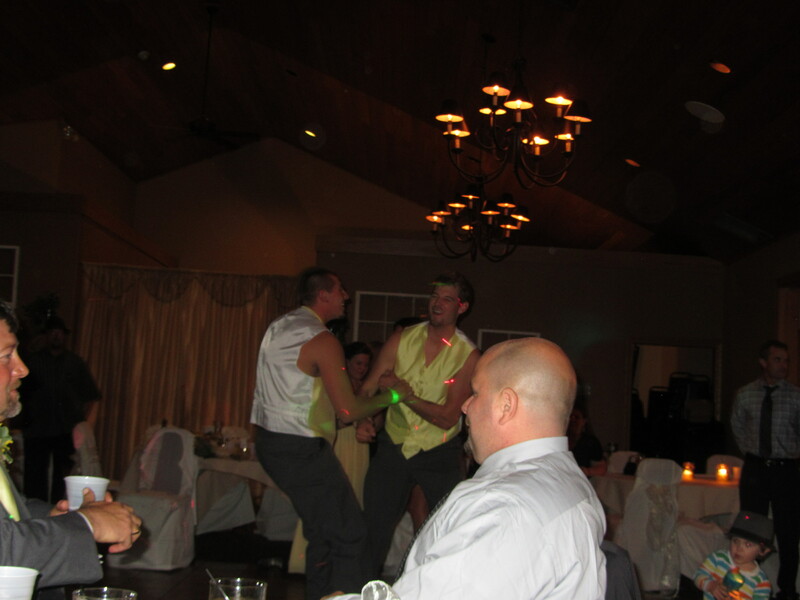 So, I crashed a wedding this past weekend…. Well, kind of. I went to see the DJ for my wedding play at another wedding, just to be sure we want him to do our wedding. 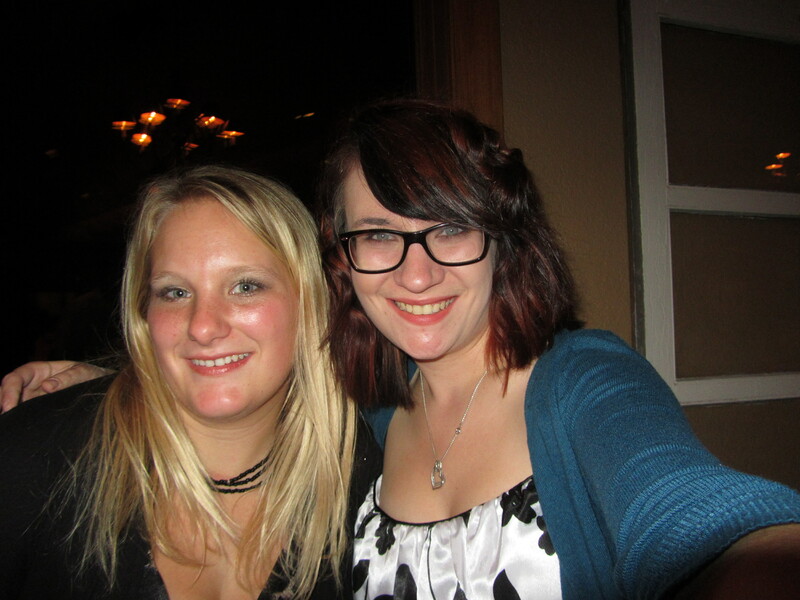 I took my friend Alex with me after we celebrated at another friend’s wedding. We didn’t know the bride or groom, but we danced and had a lot of fun! It was a lot younger crowd and quite the party! The dance floor was packed all the whole time we were there, which is something I really want at my own wedding. 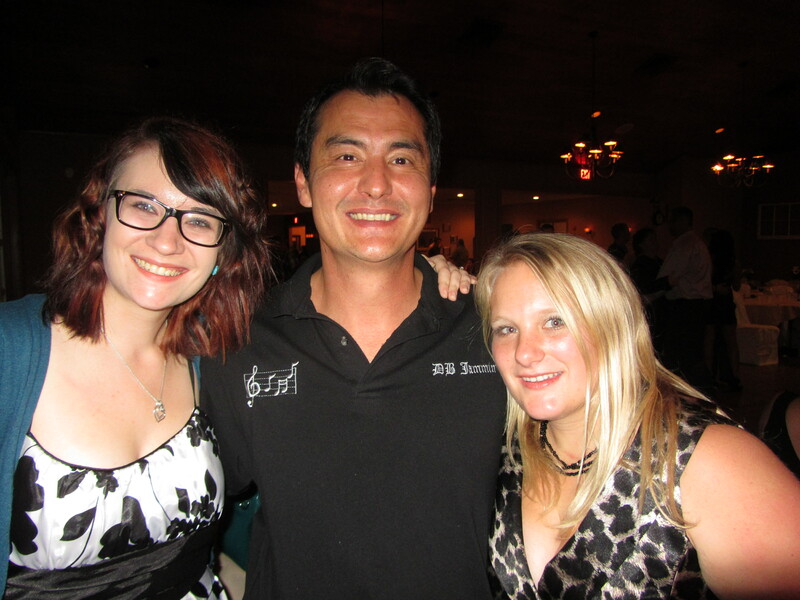 Our DJ is Mark Burdette and we work at Sentry together. He is the manager of the meat department and we started talking about him DJing my wedding and I thought it would be awesome because he has such a fun personality. He works the music while his brother Duane Em-cees. I am very confident they will give my wedding the blast of fun that I am looking for! 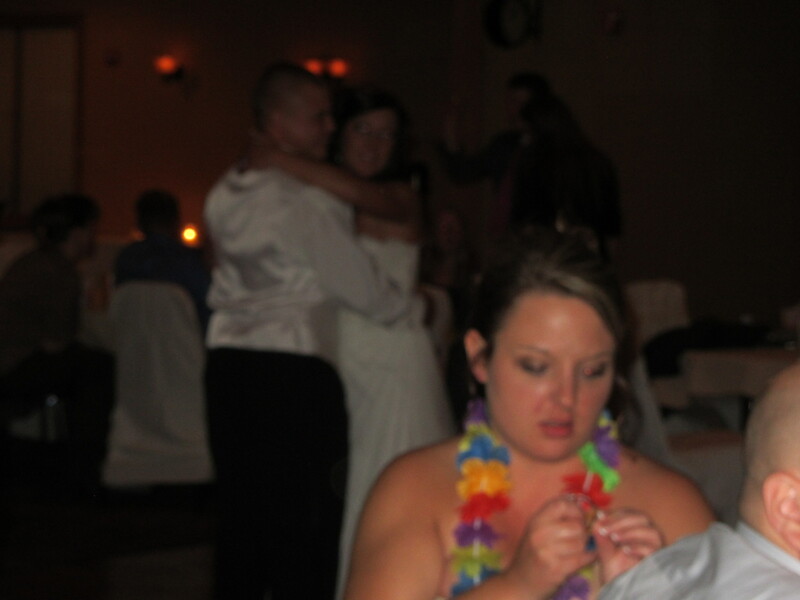 Have you ever crashed a wedding before? What was your experience? Either way, I can still tell you what I did! I used the Mary Kay mineral eye colors for this look. First I swept “honey spice” all over the eyelid and brow bone right up the the bottom of my eyebrow. Then I added some “granite” in the crease and layered some “hazelnut” over it. I then used jade eyeliner on my upper lid and bronze eyeliner on my lower lid. I also applied black liquid liner super close to the lashes. I usually don’t wear liquid liner because I’m not very skilled at applying it, but I really like the winged liner look. For the bold color, I used “emerald” along the lash line to the middle of the lid and then the other half on the outside, I used “peacock blue,” how fitting… To finish, add lash primer and ultimate mascara for Hollywood lashes! I also am loving the dark lip trend right now… the fashion world is calling it “ox blood,” but I really hate that description… I prefer burgundy. I tried “Appleberry” from Mary Kay and I’m in love. In September I was still rocking an orangy-pink shade, “Sunset” with “Mango Tango” gloss which was quite fun, but I think with the cooler weather, it’s time for some darker lips. What new music is on rotation for you? Any fun make up ideas that you are trying? Just what is it about the 1950s and 1960s that is so fascinating?